Are you looking for some printable inspiration for meatless meals? Have a look at these free vegetarian and vegan PDF cookbooks. You don’t have to sign up for anything – just click on the links and you’ll go straight to the cookbooks. If you are new to baking without eggs or dairy, these recipes from the Toronto Vegetarian Association will inspire you with the possibilities of vegan baking. This wonderful free cookbook is from Leanne Brown, the generous author behind the bestseller Good and Cheap. From Scratch is a budget-friendly vegetarian cookbook packed nutritious, doable recipes. This is another cookbook that makes it clear that you don’t need a lot of expensive ingredients to eat well as a vegetarian. These are large scale recipes for school kitchens, but if you ever have to cook for a crowd (or suggest veggie alternatives at your school), these recipes could come in handy. Here are some kid-friendly recipes from the UK-based Vegetarian Society. This is another offering from the Vegetarian Society, with more sophisticated recipes. I like large scale recipes, so here is another school lunch book one from The Physician’s Committee for Responsible Medicine. You may not need such large quantities, but there are good ideas for kid-friendly, meatless adaptations of popular recipes. If you are looking for more information on eating healthily as a vegetarian or vegan, have a look at one of these information packs. If there is a young person in your house interested in going meatless, share the information to help them make a healthy start. 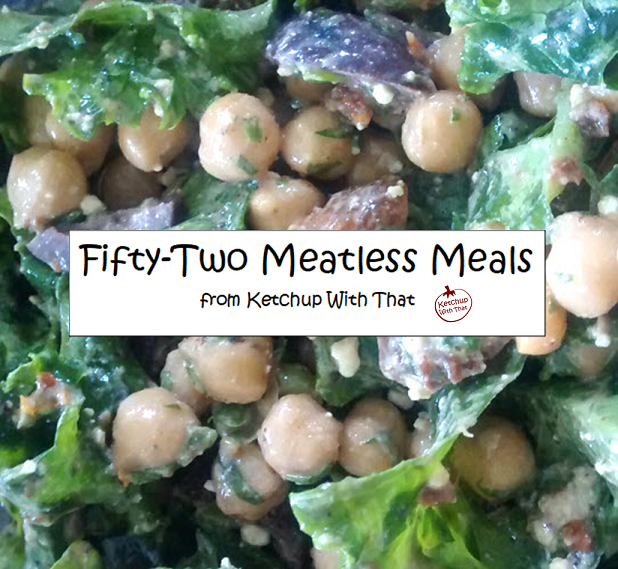 You can also download a free, printable cookbook with 52 vegetarian and vegan recipes from Ketchup With That. I love the vintage cookbooks ! Thanks so much for the effort ! I love old cookbooks, too 🙂 Thanks for stopping by! Thanks for the resources and will look into more…..Thanks for the gesture.